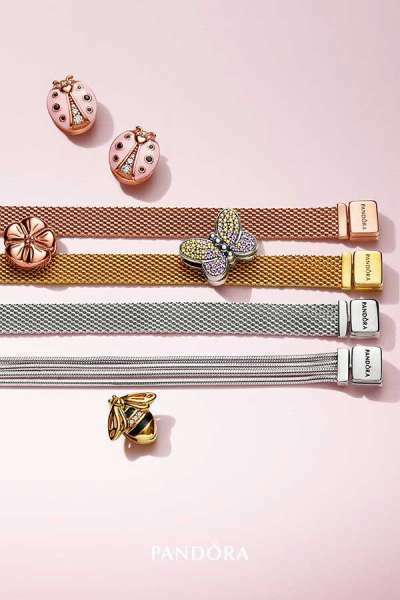 THIS season, Pandora presents a whole new garden of styles designed to inspire women to explore their creativity and express themselves in ways that feel natural to them. More than a collection, the Pandora Garden is a place of self-expression; a new way to convey feelings and express one’s femininity through a series of beautiful styles and icons. Expertly hand-finished in high-quality materials, the collection is rich in detail and symbolism, allowing women to weave meaningful messages into their personal storytelling and channel their inner confidence. Each of the nature-inspired icons—the butterfly, the four-leaf clover, the ladybird and the flower—carries a special, empowering meaning, from personal transformation to making one’s own luck and expressing her unique kind of beauty from the inside out. Step into the Pandora Garden and celebrate a unique growth story with the butterfly. Make a bold style statement by stacking the Dazzling Butterflies rings or transform one’s look by wearing the Dazzling Blue Butterfly brooch as a necklace pendant. Feel carefree with the Lucky Four-Leaf Clover pendant. Follow bliss with the ladybird and channel inner and outer beauty with the Flower Stem necklace, bracelet and earrings. One can mix these all together or pick a few key pieces that show how she feels. Her power is in her nature—wear with confidence. Inspired by nature, Pandora’s new Matte Brilliance jewelery series makes a big impact with delicate details. Catching the light with its matte yet sparkling effect, the sublime texture of the new jewelery is created without stone embellishments using a traditional jewelery crafting technique called diamond pointing. The linear, sculptural series features a bangle, a ring, stud and hoop earrings crafted in Pandora Rose. The unique, blush-hued metal blend highlights the beautiful sparkly effect while the signature cut-out heart details put a feminine spin on the statement-making designs.